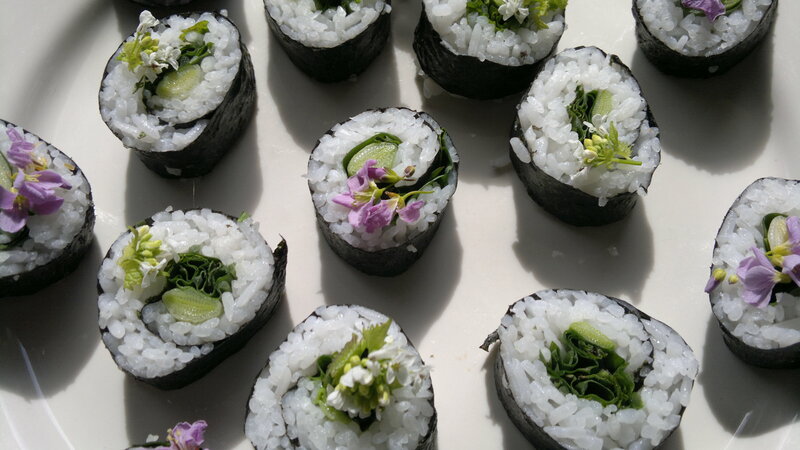 One of the very best ways to taste the vibrant shoots, leaves, and flowers of spring is in wild sushi. Many of the fresh, zinging flavours and health-giving properties of green plants such as wild garlic and sea kale are lost in cooking. 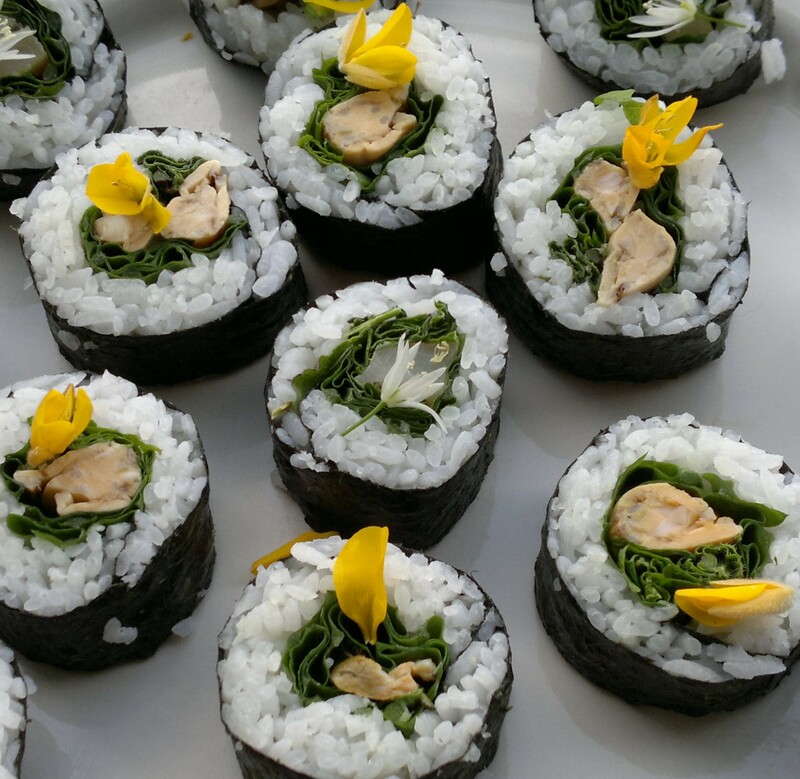 Rolling them in nori seaweed sheets with sticky rice and serving with condiments is easy, great fun and makes for the most spectacular finger-food I could imagine. 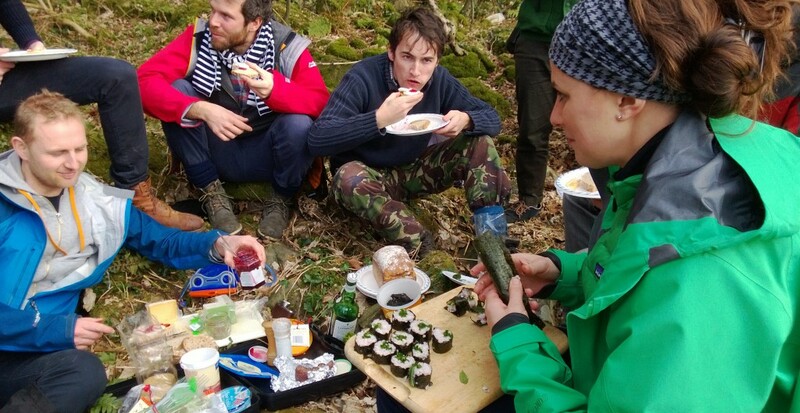 Some of my favourite wild food moments have been eating wild sushi on sunny beaches or in the dancing shadows beneath beech trees. This recipe gives guidance on how to go about it and some combinations that have worked well for me, but the real pleasure is in using what you can find and confidently identify when you are out and about, and blending them to your own taste. Succulent coastal plants like sea radish, sea aster, marsh samphire and coriander grass work particularly well. 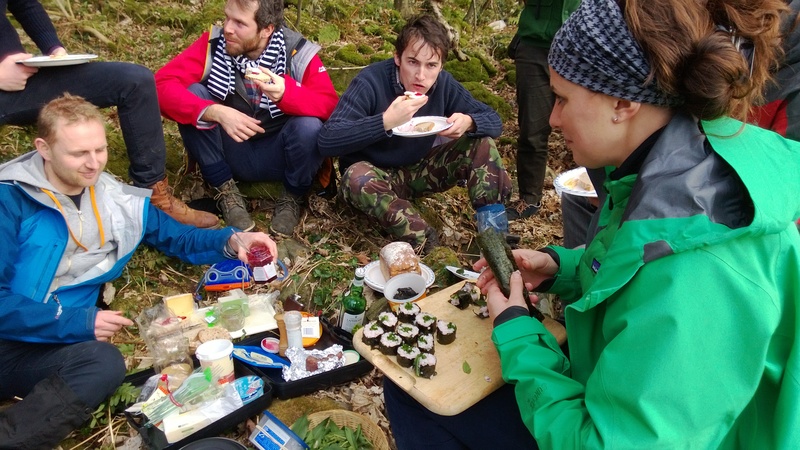 I have given ‘tame’ alternatives, but all the wild ingredients listed are common and you can learn how to find and identify them in the GWF Wild Food Guide, or follow the in-page links. Ingredients Makes about 6 rolls – a starter for 2/3 or nibbles for 6. 250g Sushi rice (available in most good delis. You can use other varieties, but the grains don’t stick together quite so well. If you want to keep things Scottish, try using pearl barley instead of rice. Nori seaweed sheets (cheap in most good delis) It is possible to harvest wild nori (laver) and process it into sheets, but it is a lot of trouble to go to for what turned out to be (in my case) an inferior product! Half a carrier bag of green shoots, leaves and flowers. Wild suggestions: wild garlic, common sorrel, wood sorrel, chickweed, sea beet, ground elder, cuckoo flower, greater cuckoo flower, sea radish, goose grass, dandelion, bittercress, reedmace shoots, marsh/rock samphire, sea sandwort, pig nuts, garlic mustard, coriander grass, sea kale, sea campion, sea aster, sea/buckshorn/ribwort/greater plantain, knotweed shoots, gorse/broom flower. Tame (in both senses of the word!) 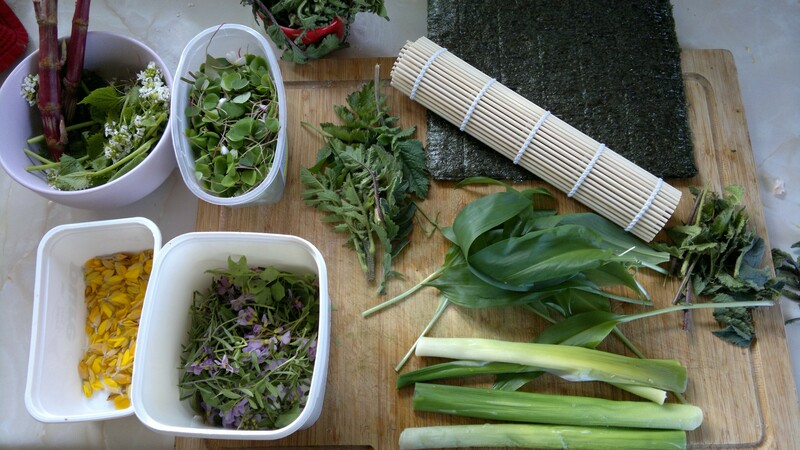 alternatives: rocket, watercress, spring onions, chives, cucumber, basil, pak choi, chicory, coriander, grated carrot. You can add a fishy punch too by using spoot clams (best raw), cooked mussels, smoked mackerel, tuna, smoked or raw salmon, crabmeat or (my favourite) raw smoked white fish. Dried seaweed flakes as seasoning (optional). Dried laver, gutweed, sea lettuce, pepper dulse and sugar kelp all work well. Wasabi paste, creamed horseradish or, for an amazing wild kick, scurvy grass and sea rocket leaves blitzed with a little water to a thick paste. Soak the unwashed rice in a pan with 320ml of cold water. After 30 minutes soaking place the pan on the heat and bring to the boil. Turn the heat down to low for up to 10 minutes or until all the water is absorbed and the rice has just lost its bite. Empty the rice onto a large, cool tray and spread it out by plumping with a fork. Drizzle the sweet vinegar over the rice and work it in gently with a fork without smashing the rice grains. When it is mixed and cooled, the rice should be sticky. It will keep well in a sealed tub in the fridge for a few days. As the rice cooks and cools, wash and dry your greenery. Most wild leaves can be left whole, but cucumber, spring onions etc should be cut lengthways into strips no longer than the width of the nori sheets. Now its time to roll your sushi! Rather than preparing everything in advance, its fun just to lay all the ingredients on the table and let people “roll their own”! Kids of all ages love it. Lay one sheet of nori on a wooden chopping board, the narrower sides to the top and bottom (some people use a bamboo rolling mat, but I find them more trouble than they are worth). Place spoon full’s of the sticky rice on the bottom two-thirds of the sheet and work them together until the rice covers the bottom two-thirds of the sheet evenly to the edges at a depth of about half a centimetre. Be sure to leave the top third empty. If you are using dried seaweed flakes, its nice to generously sprinkle them over the rice at this stage. Next, add your chosen ingredients across the middle of the rice. Wild garlic lends itself very well to this, but shorter leaves and shoots you will have to spread across the width. Don’t worry if some of your greenery protrudes beyond the edge of the sheet – this looks nice later on. When you have added as much or little greenery, fish etc as you wish (trial and error will be required! ), lift the nori sheet nearest to you and start to roll (sliding a long knife beneath may help you lift it in one go). Keep the roll quite tight without rupturing the nori sheet. When there is only a few centimetres of un-riced nori sheet still showing, dip your fingers in some water and wet the final 2cm of it all the way across its width. A final roll and you should have a large, fairly solid ‘cigar’ roll. If it hasn’t turned out very well – don’t despair! It will still taste delicious and by your third attempt you will feel like an expert! It is also possible to make the rolls without the rice for a more intense flavour-hit! To serve, use the sharpest slicing knife you have to cut the roll into 2 to 3cm wide slices (the rice will stick to the blade, so it helps to clean it between cuts). 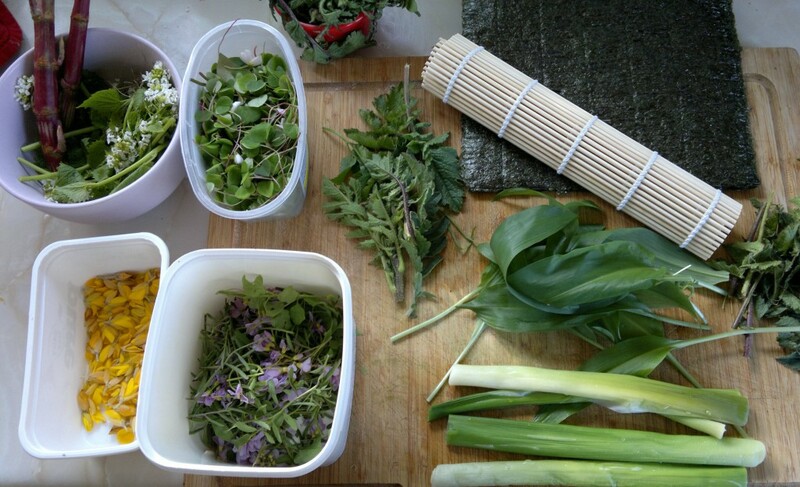 Garnish with wild garlic flowers, broom/gorse buds, or best of all, cuckoo flowers and eat with soy sauce, sweetly sticky fruit vinegar and dots of wasabi/horseradish/scurvy grass and sea rocket to taste.